Regional sports network has earned 145 total statuettes since 2000. FOX Sports Detroit was honored with a network-high 15 EMMYs on Saturday night by the Michigan Chapter of National Academy of Television Arts and Sciences. The awards were presented at the organization’s 40th annual ceremony at Motor City Casino Hotel’s Sound Board Theatre in Detroit. FOX Sports Detroit has received 145 EMMYs overall since 2000, including 100 over the last 10 years. The regional sports network received 50 nominations among 32 categories. The network was honored for its coverage of the last game at Joe Louis Arena. It was highlighted by our use of a double box to show the game as well as behind the scenes action, roving reporters that brought the viewer to every corner of the iconic arena and the post-game on-ice ceremony. The network was honored for its Detroit Tigers themed telecasts. From getting to know the players on a personal level to explaining advanced metrics and taking fans behind the scenes of the ballpark, each night was designed to enhance the viewer’s appreciation for America’s pastime. This EMMY is for the Detroit Institute of Arts #watchTOGETHER commercial spot. Basketball is an art form. To prove that, we had the DIA talk about the history of art in Detroit and how Pistons basketball is a part of that culture. This EMMY is for the community driven #watchTOGETHER commercial campaign. It showcases the real people, places and organizations of Detroit and how FOX Sports Detroit is a part of their daily lives. This EMMY is for a compilation of directing by Mark Iacofano for Lions, Red Wings and Tigers. This EMMY is for the editing techniques Brian Ducoffe utilized for all the promos that ran throughout the year. This EMMY is for a compilation of lighting by Chad Schwartzenberger. This EMMY is for a compilation of photography by Chad Schwartzenberger. This EMMY is for the essay John Keating wrote for the final game at Joe Louis Arena. This EMMY is for the Spartan Basketball All-Access episode What Matters Most. This EMMY is for the program Concussions and the Modern Athlete. This EMMY is for the Spartan Football All-Access episode Couldn’t Break Us. This EMMY is for an installment of our digital series Away from the Spotlight on one of the young men who turned his life around through his experience at the Detroit Boxing Gym. The network was honored for its Spartan All-Access episode on Lourawls ‘Tum Tum’ Nairn Jr. This EMMY is for the one-time special State Champs! Legends Jalen Rose. 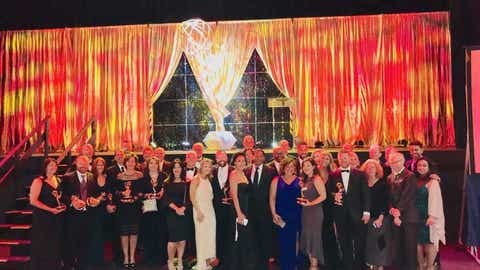 The Michigan Chapter of the National Academy of Television Arts & Sciences (MI-NATAS) is the most recognized non-profit organization dedicated to the advancement and recognition of excellence in television. The EMMY is a distinct honor awarded to TV professionals. Judges, representing EMMY selection committees in other parts of the country, scored the Michigan nominations based on content, creativity and execution of work. For a complete list of winning entries, visit www.natasmichigan.org. FOX Sports Detroit is delivered to 3.2 million cable and satellite households throughout Michigan and portions of Northwest Ohio and Northern Indiana. The regional network is home to more than 350 live, local events per year, including the Detroit Tigers, Red Wings and Pistons; college hockey; and Michigan High School Athletic Association football and basketball championships. We are the cable TV home of the Detroit Lions.